Cadiz Comfort Zone......The home of local art from Trigg County. Big pigs, little pigs, pigs that smile alot. Pigs with wings, step on pigs, even pigs for flower pots. Big pigs like you see around town are $150.00 with FREE DELIVERY in Trigg County. Pick up some favorite southern recipes. Our Artists are avid readers. So we have a book rack of all kinds of literary works to choose from. YOUR CHOICE $5.00. 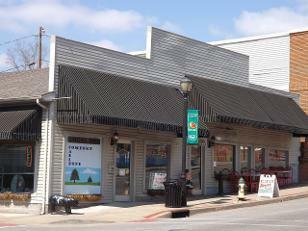 Come see us at 65A Main Street, Cadiz KY , right next to Reva's Place. You can shop and eat or eat and then shop. Stop by and say hello, browse our new artists and enjoy new art from an old favorite. Cadiz Comfort Zone is a Kentucky Proud Retailer! A stop into our PANTRY is a must for everything good. We have a great selection of Western Kentucky books and authors. Need something sweet? Handmade English toffee is a marvelous choice made with Giardelli Chocolate and love from Cadiz..
For the kids, candy building blocks made in the USA. Make a car then eat it. Everyone loves the chocolate camo rocks also made in the USA !